These socks come with a secret pocket large enough to conceal your passport or other valuables. On your next travel adventure, be sure to pack the Fort Knox of socks! They come with a secret pocket large enough to conceal your passport, cash, and other valuables. The zipper is made of nylon, so it won't set off metal detectors, and it rests just above the hem of your pant leg, making it essentially invisible to pickpockets. 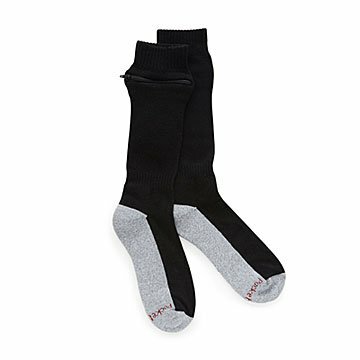 The socks are crafted from soft, eco-friendly bamboo yarn, making them comfy soft for long days of walking. And they wick so well that, not only will they keep your feet cool and dry, but also, if you wash them out at night, they'll be dry by morning. Made in California. In 1998 Evan Papel embarked on a European trek across over 9 countries. Somewhere in Italy, Evan’s pocket was picked and he lost his money and passport. The crisis was resolved after sidetracking several days of his trip, but the inspiration came from this incident, as well as a huge beer at the Haufbrauhause in Munich! Machine Wash Warm, Tumble Dry, Do Not Bleach. For travelers, sink wash with detergent, rinse with cold water, wring dry, hang to dry overnight. I bought these for an international trip and found it very practical. The pocket was comfortable and the passport fit in fine. I used them on my big travel days and the bamboo yarn is very soft. I wore them one other time during the trip when I had tall boots on and didn't need a purse. Winner.